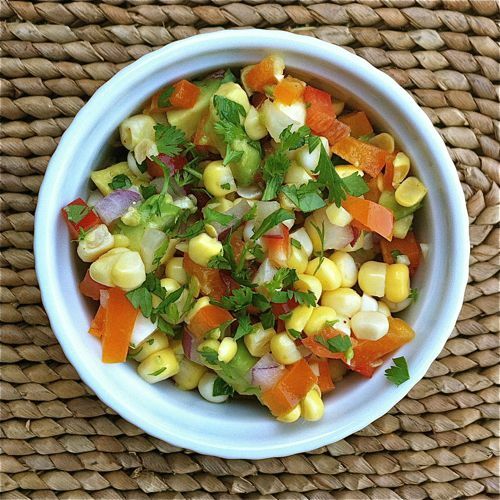 Crunchy sweet corn kernels and chunks of creamy avocado coated with a spicy lime dressing makes a great salad, salsa, or relish—depending on how you want to use it. Serve it on a bed of greens, on tacos, or with chips. Cut the kernels from the ears of corn and put in a large bowl (I like to cut the kernels off working with the ear set into a large bowl to catch them all as they fall off). Dice the red pepper and the red onion and add them to the corn kernels. Ideally, you'll cut the pepper and the onion into a dice that's close to the size of corn kernels for a most pleasing texture. In a small bowl or measuring cup, combine the oil, lime juice, vinegar, salt, cayenne, and pepper. Stir or whisk the mixture until it's well combined. Pour it all over the corn mixture. Toss to coat the vegetables evenly and thoroughly. Just before serving, peel and dice the avocado. (See below for step-by-step directions if avocado dicing is new to you!). Add the diced avocado to the salad. Use a large spoon to gently fold the diced avocado into the salad/salsa. Serve immediately and at room temperature. Cut the avocado in half lengthwise around the pit. Twist the two halves to separate them. Hold the side with the pit in it in one hand, and whack a large knife into the pit, catching it on the edge of the knife. Twist the knife slightly to loosen the pit and remove it (if using a knife this way makes you nervous, you can simply use a large spoon to scoop out the pit). Again, holding a half of the avocado in one hand, use the tip of a knife to cut through the avocado flesh just to the peel. Be careful and gentle doing this. Cut slices one direction and then turn those slices into chunks by cutting slices perpendicular to the first slices. Flip the avocado peel inside-out, popping out the chopped avocado pieces—letting them drop into a bowl. Repeat with the second avocado half.